Falmouth Products Electric Catalytic Oxidizers (FALCO) are Listed for use in hazardous locations. Please follow the links for FALCO 100, 100 (Canada), 300/600 and 300/600 (Canada) Certificates of Compliance from FM Approvals. Catalytic and thermal oxidizers used in Soil Vapor Extraction applications treat petroleum vapors extracted from the ground. Unlike industrial applications, the concentrations of extracted vapors can vary widely. Various strategies are used to regulate the concentrations of these vapors before they are introduced into the oxidizer. Most designs, at a minimum, involve the introduction of dilution air. FALCO catalytic oxidizers utilize precise Vapor Control Valves (VCV’s) which control both dilution air and source vapors. Regardless of the control strategy, there is still a potential for vapors within the flammable range to enter the treatment device. According to the National Electrical Code: A Class I, Division 2 location is one in which flammable vapors may exist under abnormal conditions. For example: If an oxidizer is treating Gasoline vapors at an SVE site and a technician rapidly closes off lean wells and delivers a concentration spike to the oxidizer, then the area inside the oxidizer (and the piping leading into it) is appropriately classified as Class I, Division 2, Group D. This situation is likely temporary and abnormal, but it exists. There is a potential for a mixture of vapors within the flammable range to exist inside an oxidizer. All oxidizers contain ignition sources (heaters or burners and catalyst). Many manufactures scale down oxidizers originally designed for industrial use and sell them for soil vapor extraction. 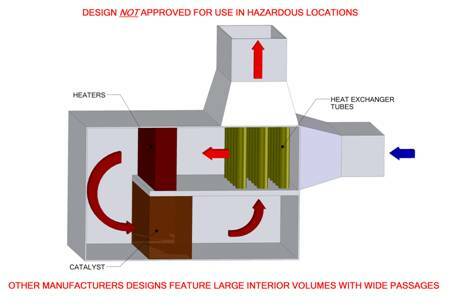 This is easier than designing equipment specifically to meet hazardous location requirements. These designs have large interior volumes which may result in high peak pressures if an internal explosion of flammable vapors occurs. FALCO designs have been third party tested for integrity by repeated ignitions of mixtures of Propane and air, representative of Group D gases, within the vessel. Although unlikely... What happens if there is ignition? FALCO catalytic oxidizers utilize integrated designs with small interior volumes vented to the stack and any resulting explosion pressures are small. 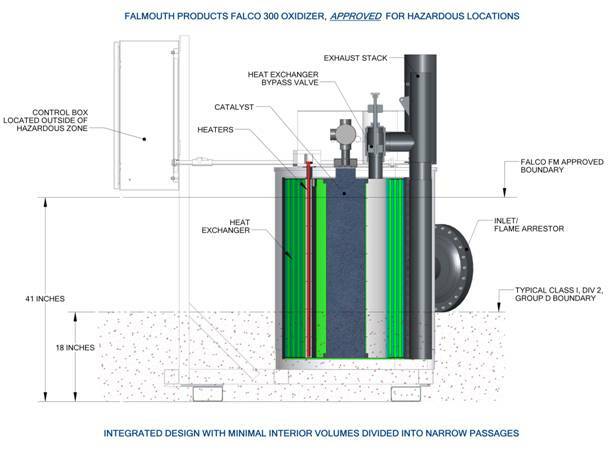 FALCO oxidizers include a heat exchanger, catalyst chamber, and heater integrated into a compact package with minimal interior volumes divided into narrow passages. Other manufacturers use individual components ducted together resulting in large interior volumes with wide passages. FALCO catalytic oxidizers and FALCO flame arrestors meet strict flame-path construction requirements and have passed flame propagation tests. This is important if an oxidizer is installed in a hazardous location such as Class I, Division 2, Group D, as often exists at SVE sites up to 18” above grade. A small flame-path (gap) between flanged surfaces prevents the propagation of a flame from one hazardous location (inside the oxidizer) to another hazardous location (the site). Oxidizers that don’t meet flame-path requirements could ignite the surrounding atmosphere if an internal ignition occurs. Equipment approved for use in hazardous locations is marked with a temperature classification when surface temperatures exceed 100°C.Temperature class codes appear on labels of explosion proof electrical equipment indicating suitability for use in hazardous locations. For example: Equipment marked T2C (230°C) must not be installed in locations containing vapor with an autoignition temperature less than 230°C as the hot surface could cause an explosion. Gasoline, which is the most commonly extracted vapor at SVE sites, has an auto ignition temperature of approximately 246°C (475°F). Therefore, if a thermal oxidizer has surface temperatures in the hazardous location which exceeds 475°F, these surfaces have the potential to ignite a flammable mixture of Gasoline. Group D vapors being treated at SVE sites (typically Gasoline) are heavier than air and if discharged, settle at ground level. FALCO‘s are FM Approved for use in hazardous locations typically encountered at SVE sites. For example: The FALCO 300 is FM Approved for Class I, Division 2, Group D, T2C Hazardous locations extending up to 41” above grade. During FM testing, the surface temperatures of the FALCO 300 within 41” of grade did not exceed 200°C. Although the FALCO 300 exhaust stack operates at temperatures exceeding the autoignition temperature of Gasoline, it is outside of the hazardous location and is therefore not considered a source of ignition. The FALCO 300 control box is mounted out of the hazardous location and also is not considered a source of ignition. In the United States, the user (or customer) carries the burden to make sure equipment meets OSHA worker safety requirements (29CFR1910) and is approved for a particular application. Other than for custom equipment, this means that the equipment must be listed by an OSHA accredited Nationally Recognized Testing Laboratory (NRTL). Many of the sites where remediation equipment is installed are properly classified as Class I, Division 2 Hazardous Locations and it is the customer’s responsibility to use OSHA NRTL Approved equipment suitable for these locations. Follow the links for Falmouth Products FALCO 100, 100 (Canada), 300/600 and 300/600 (Canada) CERTIFICATES OF COMPLIANCE from FM Approvals, an OSHA NRTL, detailing the hazardous location approvals.